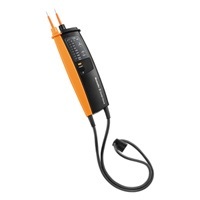 Step-type voltage tester for indicating AC and DC voltages from 6 - 690volts. Line resistance < 500KOhm in continuity test are also accompanied by an audible signal. The combicheck 1.2 permits phase testing and has the additional feature of an integral torch function.